PREMIUM QUALITY PROTECTION: This 12 pack of 84 in. 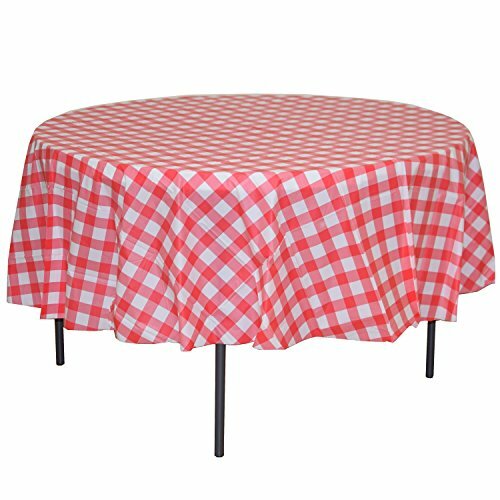 Round Red gingham plastic picnic tablecloths, will cover any table up to 8 feet. Unlike your typical paper table clothes these disposable checkered table covers are spill and waterproof!!! SPILLPROOF: No need to worry about those spills anymore! Our premium red and white gingham plastic picnic tablecloths are waterproof!! HIGH OPACITY: covers any table with minimal transparency. Great plastic table clothes for parties, weddings, holiday party, thanksgiving dinner, bbq, July 4th, picnics, and any checkered themed event. DISPOSABLE: Disposable works! When the party is over, cleanup is easy - just roll up the disposable tablecover and dispose of it. SELECTION: Our heavy duty plastic table covers are available in rectangle and round. cover your tables with our disposable checked table coverings made heavy plastic and sure to hold up well.